Alligator Gumbo - unpolished traditional and self written cajun music from the heart! Alligator Gumbo is a band from southern Sweden that, due to the members' love for the music of southern Louisiana, interprets and plays traditional and self-written Cajun music in a way that is true to tradition. The vocals are unrestrained and emotional and sung in Louisiana French, the particular French dialect developed in Louisiana. The great enthusiasm of the organizers and the audience has not only spread in the north, both Alligator Gumbos albums Simmerin' (2014) & Lacassine Special (2012) has won first and second runner up position in ”Le Prix D'Hors de Nous 2014” by The French Cajun Music Association, Lafayette LA. The prize is awarded annually to the best cajun music recorded by a cajun band outside Louisiana. 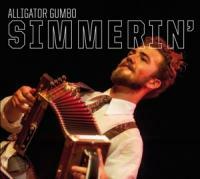 The album Simmerin' is also dedicated to Alligator Gumbo´s accordionist Thor Ahlgren's journey in southern Louisiana. There he met luthiers and jammed with legends of Cajun and zydeco music, and also surprised by playing bagpipes in the cajun music.